Milissa Carey, Renée Rogoff, Gwen Loeb. All photos by Jim Norrena. Nicol Foster, Regina Morones, Gwen Loeb, Radhika Rao. “We women of America tell you that America is not a democracy. Twenty million women are denied the right to vote.” Alice Paul, suffragist. Americans pride themselves as being world leaders and as offering freedom unlike anywhere else. Among societies, we are possibly the most tied to legal documents that define our freedoms and ourselves as a people – the Declaration of Independence, the Constitution with its Bill of Rights, our laws, and Supreme Court rulings. Yet, for all our pride, the road to true freedom for everyone has been marred by antidemocratic intransigence from those already privileged, unwilling to grant freedom to others. This has been true of the movements for the abolition of slavery, for women’s rights, civil rights, and voting rights. And in each case, the courageous few who risked everything for the cause were subject to vilification, harassment, and sometimes, death. 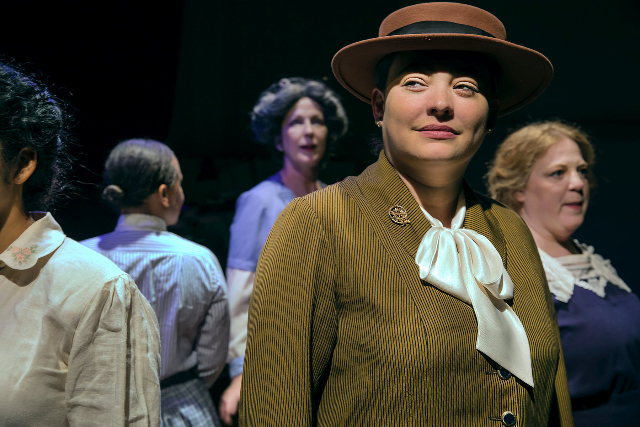 Susan Sobeloff’s captivating world premiere drama at Central Works, Strange Ladies, tells of the hazards and punishments suffered by one group of intrepid advocates, the women’s suffrage supporters of the early 20th century. Their efforts would ultimately lead to the passage of the 19th Amendment in 1920, but not before much societal division, pain, and loss. 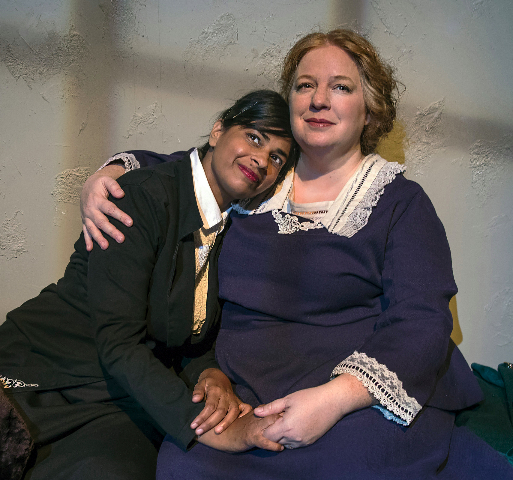 Based on real participants in the suffrage movement, the playwright depicts six characters who reflect the whole spectrum of women – society and laborer; black and white; Jewish immigrant and long line American Christian. We see the unified commitment to gaining the vote, but as with other movements, we also see the fracture lines. Two leaders of the group bicker. Harriet is conciliatory and wants to avoid all violence by demonstrating as “silent sentinels.” Alice endorses tactics that British suffragettes had used such as breaking windows, an apt foreshadow of today’s more advanced quest for women to break through glass ceilings. Meanwhile, Mary wants to ensure that black women are included in the amendment for women’s voting. Brief scenes reveal the interactions among the women. In addition to political discussions, the women deal with personal issues and confrontations. The action occurs in a tumultuous period with other developments that would influence suffrage. As the country contemplates and eventually enters World War I, some suffragists are concerned that protesting, particularly at the White House, might be considered unpatriotic and undermine sympathy for the movement. Conversely, labor abuse and a series of tragic events like the Triangle Shirtwaist Factory fire in which 146 women died have a supportive effect as women clearly participate in the risks of the political economy. Yet industry would use war as a pretext to suppress workers’ rights and unionization and would continue harsh and dangerous practices. 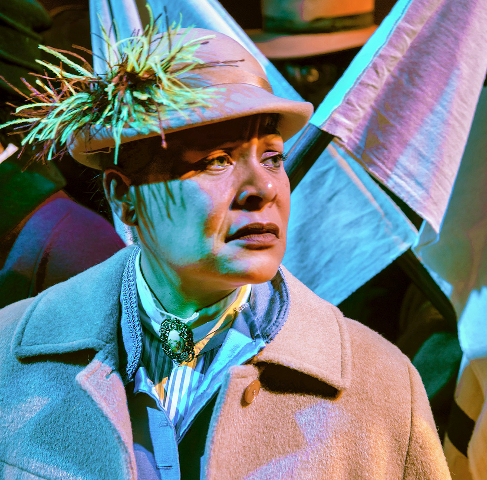 The portrayals of the resolute suffragists, led by Milissa Carey and Renée Rogoff, are sterling on all counts. They perform without a set, but the totally bare stage works well thanks to two factors. Director Jan Zvaifler uses purposeful movement to create a sense of distance and space, with characters frequently entering and exiting the stage. Gary Graves uses lighting to exceptional effect. Blackouts between scenes and frequent spot illumination creates drama and symbolically show the suffragists moving into the light. The use of gobos (stencils placed in front of stage lights to cast shadows) to imply prison bars or building windows creates a sense of place. 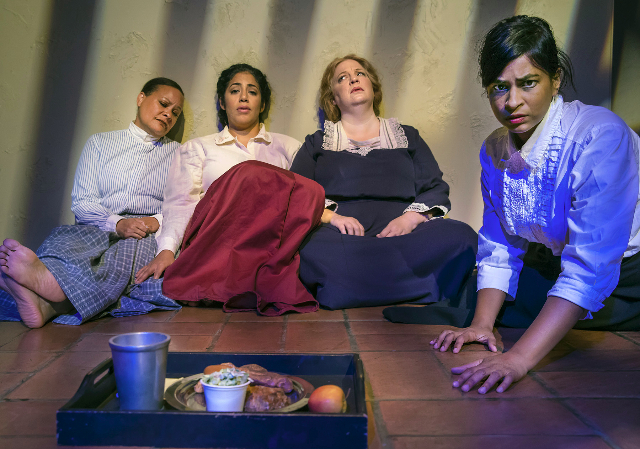 Strange Ladies greatest strength is its informativeness about the history of the movement, and additionally about the Occoquan Workhouse Prison, where public officials contrived to imprison and abuse some of the suffrage women. The institution of the workhouse prison is another bleak chapter of American history that is too seldom told. (For a thorough, unvarnished picture of the real lives of Americans through our history, read Howard Zinn’s A People’s History of the United States.) Another element that Sobeloff introduces is the a cappella rendering of several topical songs which add to the period feeling. The intensity of the action in Strange Ladies is unrelenting. While the tension is compelling, the dramatic arc has limited variability and lacks strong peaks. At 70 minutes, the play is compact and impactful, however, its brevity also inhibits development of longer sub-narratives which might help ease and build dramatic tension. Finally, the sense of closure is absent. Use of the narrative device of leaving the observer dangling is common, but usually the non-ending is conveyed with clarity. This work seemed to stop in mid sentence as if unfinished. Nonetheless, the play deals with an important subject that it explicates with precision; it is performed with great passion and sensitivity; and it utilizes limited resources to create a strongly evocative sense. Strange Ladies by Susan Sobeloff is produced by Central Works and plays at Berkeley City Club, 2315 Durant Street, Berkeley, CA through November 12, 2017. Posted courtesy of For All Events.